Atlanta Piano Fortissimo provides in home piano lessons and keyboard lessons for students at all ages and levels. This includes a young child just starting out, an intermediate or advanced student that’s ready for more rigor and challenge, as well as an adult student at any level of ability. Piano makes a great “first” instrument because of the music knowledge foundation that piano lessons provide, including technique, theory and a simple, linear understanding of the grand staff. Plus, you learn how to read both the Treble Clef (high sounds and the Bass Clef (low sounds). If your child ever wants to try another instrument, they can choose just about any of them and already know their language. That’s quite a benefit! Our in home piano and keyboard lessons are designed for students ages 5 and up and are either 30, 45 or 60 minutes in length. Our piano instructors teach a variety of styles from classical to popular music, and they base the curriculum on individual growth and expectations set by the student and parent. We teach the fundamentals of sight reading, technique and theory as well as incorporate your favorite songs into the lessons. 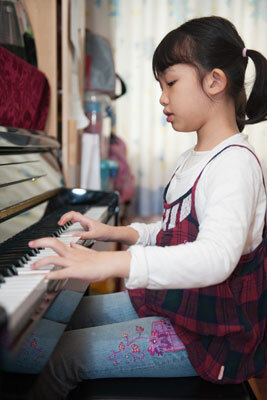 Piano lessons for beginner students will typically focus on a variety of method books. We follow the traditional approach, and the teachers are comfortable with the most popular beginner piano methods including Faber, Hal Leonard, Bastien, Alfred etc. These books are carefully crafted to be fun and engaging while instilling fundamentals such as note-reading, music theory and technique. Intermediate and advanced level students would normally graduate out of using method books and are ready to learn more complex pieces of music. Piano lessons for such students will focus on expanding technique, repertoire, theory and musical refinement. We also offer adult piano lessons. If learning a piano is your lifelong dream or you used to take lessons as a child and are looking to improve your skills, we can help you! The best part is you’ll be surprised at how fast you will learn. Whatever your goals are, we will help you achieve them in an encouraging and friendly environment.